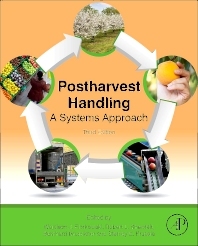 Postharvest Handling, Third Edition takes a global perspective in offering a system of measuring, monitoring, and managing produce processing to improve food quality, minimize food waste, reduce risks and uncertainties, and maximize time and resources. This unique resource provides an overview of the postharvest system and its role in the food value chain, and offers essential tools to monitor and control the handling process. It shows how to predict and combat unexpected events (e.g., spoilage), and manage the food quality and safety within a facility. Proven research methods and applications from various viewpoints are available to help you maintain high-quality produce and achieve the highest yields possible. The book also explores current challenges—including oversupply, waste, food safety, lack of resources, sustainability—and best practices for production to thrive in spite of these challenges. Postharvest physiologists or technologists across the disciplines of agricultural economics, agricultural engineering, food sciences, and horticulture along with handlers of fresh or minimally processed products within the fresh produce processing industries will find this to be an invaluable resource. III How do consumers define quality? IX Regulatory issues for the future?